It is not simply that Grosvenor’s sculptures succeed in making the discrepancies of memory and reason concrete, but that his 2017 installation of Untitled 1989-1990 fulfills it so completely, both according to the work’s unique comportment and the properties of its context. The sculpture is comprised of two long rows of cinder blocks supporting a corrugated tin roof with a plexiglass skylight. A vintage scooter leans against a nearby wall; it is finished in the same matt blue as the (albeit more weathered) corrugated tin ceiling. Freshly built walls snuggle around the installation on the fourth floor of a university in Chicago’s South Side and everything about the room feels settled, as though its parts have been waiting to be put to use for some time. And yet part of encountering Untitled 1989-1990 in this particular venue is remembering the rickety elevators upon which one traveled to get to the gallery; these well-used, utilitarian boxes seem vulnerable and frail in comparison to the weight of Grosvenor’s cinderblocks. As though by moving up and down on a vertical plane multiple times each day, they reflect a strange anxiety in comparison to the horizontal, and perhaps also useless sprawl of Untitled 1989-1990. Afterall, this work doesn’t even have a name to offer but rather a span of a single year in the almost distant past. Could it have been carried up the same elevator? So, the immediate experience of Untitled 1989-1990 brings me back to that state just before sleep, where I work over logistical and architectural reconciliation. There is something joyful about discovering uncertainty in his shelter, for if it is here might it not exist everywhere, in all of the architectures one takes for granted each day? The vulnerability of our elevator comes to mind again, inviting interrogation. There is room to doubt and puzzle and intervene, challenging the authority of seemingly ancient institutions and skyscrapers the break the horizon. So the scooter comes to mind again: referred to as “adjunct” by the artist, it has never allegedly been shown with the piece before now. And, in a way, it rests here like the performance of an afterthought: boasting the triumph of agile movement—you can almost imagine the ease with which the vehicle could loop around the gallery—poised in stark contrast to the heavy, rectilinear form of its untitled relation. I at least identify with this object; it could almost fit under the shelter and its mobility suggests somehow that it occupies a different time frame, like something less permanent than the cinder blocks it communes with. While it’s true that Grosvenor’s work teases the viewer with a kind of mystery, it nevertheless reveals the building blocks we take for granted in daily life, unearthing their form to show an almost linguistic diagram of conscious thought. 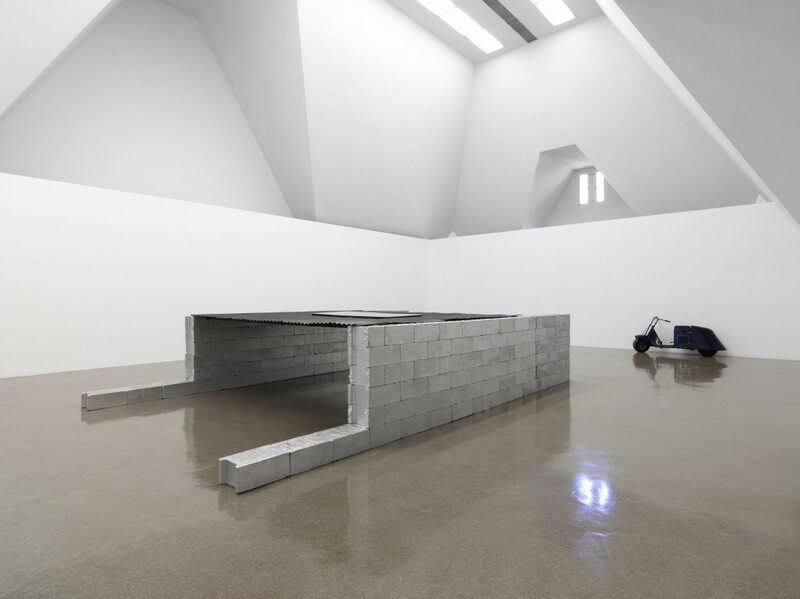 Robert Grosvenor ran at the Renaissance Society from February 11, 2017 to April 9, 2017. May 11, 2017 | Filed under Art Seen: Chicago and tagged with Caroline Picard, Renaissance Society, Robert Grosvenor.